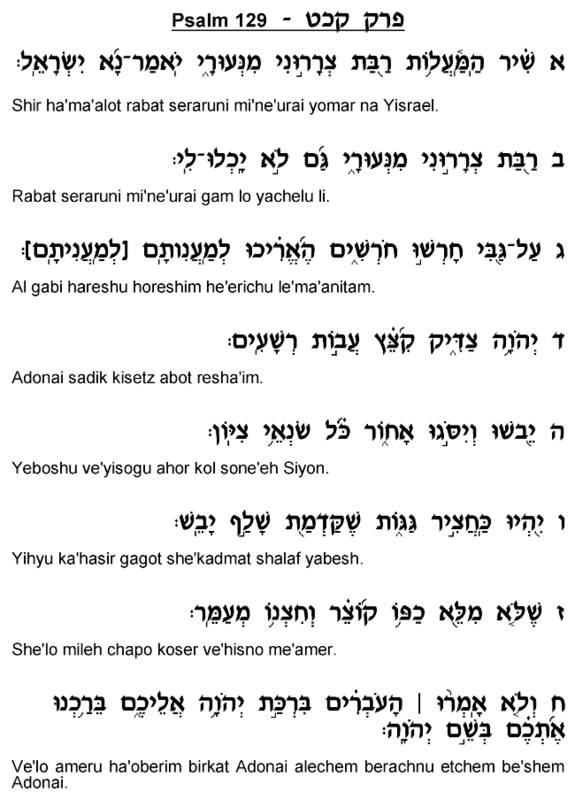 Psalm 129 calls upon the Jewish people to give thanks to the Almighty for the miraculous protection He has granted them throughout the period of exile. Many different nations have oppressed us and sought to destroy us since "our youth" (verses 1-2), since the earliest years of our current exile, yet Am Yisrael continues to survive and flourish. The Psalmist (verse 3) likens the oppression we have endured to the yoke of the plowshare upon the back of oxen, a very accurate portrayal of the dehumanizing discrimination to which we have often been subject. Many enemy regimes looked upon the Jewish people as a subhuman race that could be abused and enslaved like oxen. But the Almighty "severed the chains of the wicked" (verse 4) and released us from the yoke of racial oppression and torment. 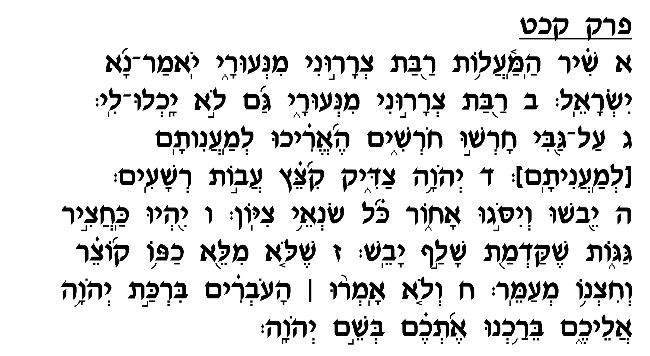 In the final verses (verses 6-8), the author offers a prayer that the enemies of Am Yisrael should be like grass and weeds that quickly wither and are never harvested along with the crops. Ibn Ezra insightfully notes the contrast between this description and the analogy drawn several chapters earlier between the redeemed Nation of Israel and joyful harvesters (126:5-6). Throughout the centuries of exile, the Jewish people "sow the seeds" of redemption which will ultimately grow, ripen and be harvested during the time of Mashiah. In direct contrast, the efforts of the enemy nations are described here as producing dry, useless weeds, which nobody even thinks to pick from the ground. We can find consolation in the promise that our toil and labor under the harsh conditions of exile will eventually yield "fruit," in the form of the great rewards that await Am Yisrael at the time of the final redemption. The efforts of the wicked, by contrast, will ultimately prove futile, as they yield no long-term benefits for the world or for themselves.